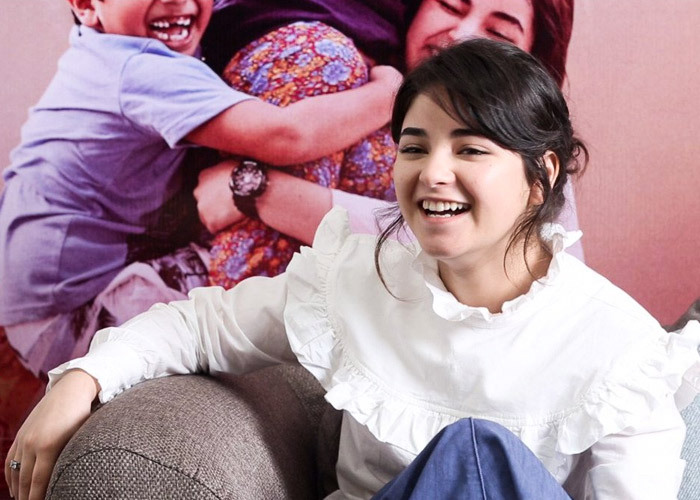 Bollywood's Secret Superstar Zaira Wasim gets ready for showbiz. No actor went unnoticed in Dangal. 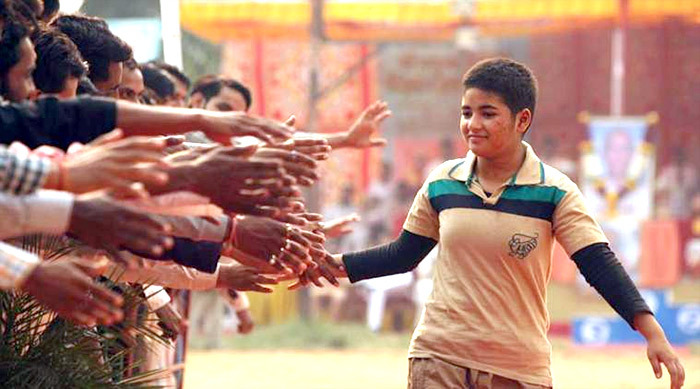 And that included the girl who played the young Geeta Phogat, Zaira Wasim. While some actors may have to wait for their second film, Zaira had it easier. "I had two films in hand even before I started shooting for the first," Zaira says. 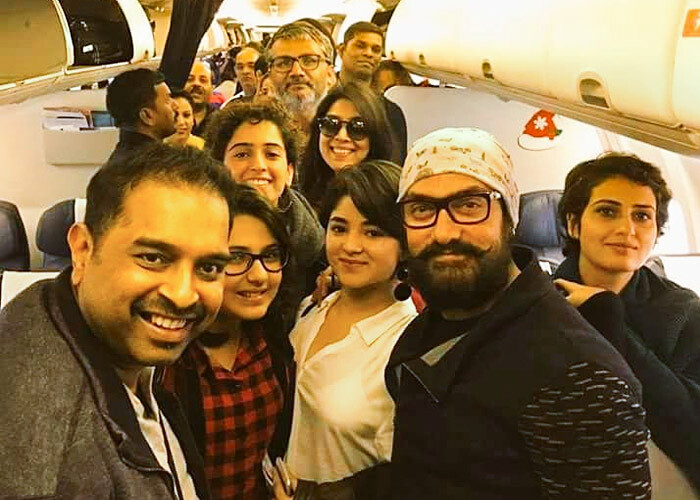 Advait Chandan, Aamir Khan's former manager, who makes his directorial debut with Secret Superstar, was so desperate to have Zaira as the lead of his film that he asked to quit Dangal and launch her career with his movie. Zaira saw it as a joke, of course. "It was hilarious when he said this to me," Zaira smiles. "I knew Dangal would be my priority." But Zaira was excited about Secret Superstar as well. IMAGE: 'When I say I miss school, I mean my friends and the fun. Not the school.' 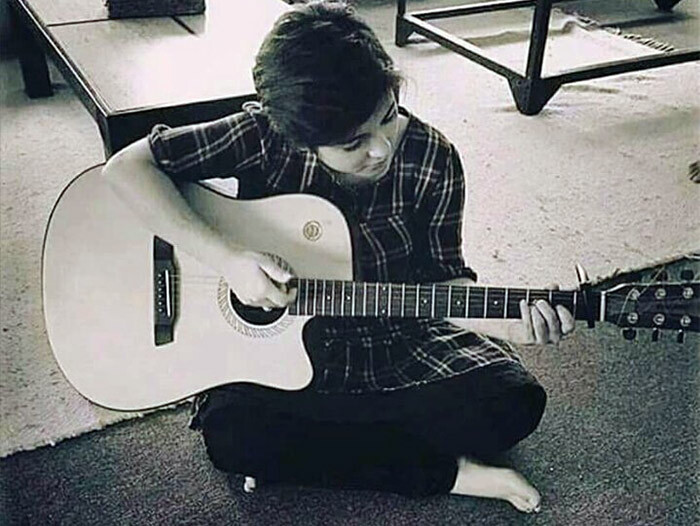 Photograph: Kind courtesy, Zaira Wasim/Twitter. "I never thought I would get a chance (to act). It almost feels surreal," she says incredulously. She had tried her hand at acting before she was signed for Dangal. In school, she played the protagonist in a play about female foeticide and it turned out to be a great success. Her principal discovered that Zaira could act as well as 'survive' in front of an audience. "Later, a casting director from Mukesh Chhabra's office was in Kashmir, looking to cast a girl in a film. He happened to visit our school at the same time and my principal gave my name. "I went for the audition, shot one ad, then another ad and then got a call for Dangal. In the middle of the prep for Dangal, I got a call for Secret Superstar," she says. 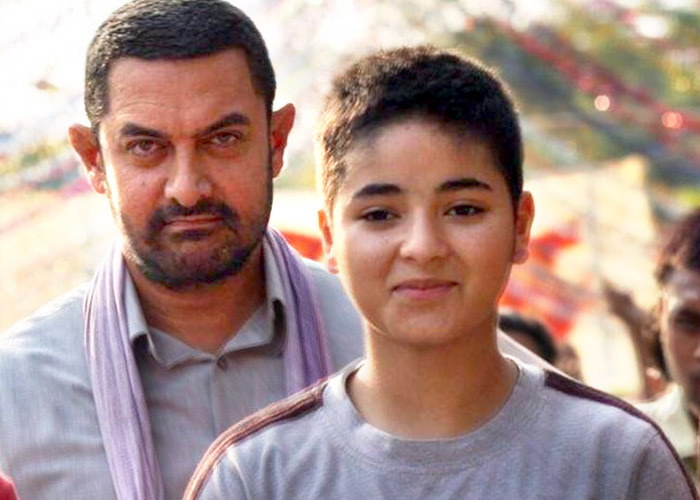 IMAGE: Aamir Khan and Zaira in Dangal. She tells us about her first meeting with Aamir Khan. "It was pretty chilled because we did not know we were going to meet him. And we didn't know he would look like a ball!" she laughs. "It was the second day of the audition; we were sitting in a room. We were 19 girls and then, a fat man with white hair entered; he had no airs. He was so simple. He sat with us and started talking to us. Gradually, we become comfortable around him," she recalls. As she worked with the superstar, she discovered something more about him: "All of us know how dedicated he is. We always call him a 'perfectionist'. But I think it's not perfectionism; it is passion, dedication and love for his work," she analyses. "He loves playing pranks on people. On set, you can't figure that out because he is too much into character. At home, he is just like any other normal guy." Now, Aamir is like family for her. "The whole team -- Sanyadi (Malhotra), Fatimadi (Sana Shaikh), Ritwik (Sahore), Aparbhaiya (Aparshakti Khurrana), Aamir sir, Kiran ma'am (Rao), his mother (Aamir's mother) -- was like family. If I need advice or need to talk to them, they are just a call away," she shares. How much has her life changed after Dangal became a blockbuster? "The only thing that has changed is that,every time I step out, I receive a lot of love. People come to me, they want to talk to me, click pictures..." Zaira shares. She's even getting love letters. "Apparently, it was a love letter from a guy of my age. I think it was from Gorakhpur. It was very sweet. I don't know how he managed to find my address," she says. Her family and friends are also proud of her but she quips, "I wish they would treat me a little differently!" Zaira's mother Zarqa stays close to her daughter during the interviews. "She is used to it," Zaira tells me. "When I shoot, she stays in the van all day. Maybe she doesn't come on set thinking she will distract me." How do her parents deal with her stardom? "They are very proud but they don't show it in front of me, I wish they would. I wish they would praise me but they don't. They always criticise me saying koi kaam nahi karti, nalayak ladki, lazy," she says with a grin. "They also tell me, 'Koi shaadi nahi karega,' which is very weird. But I know they are secretly proud of me." 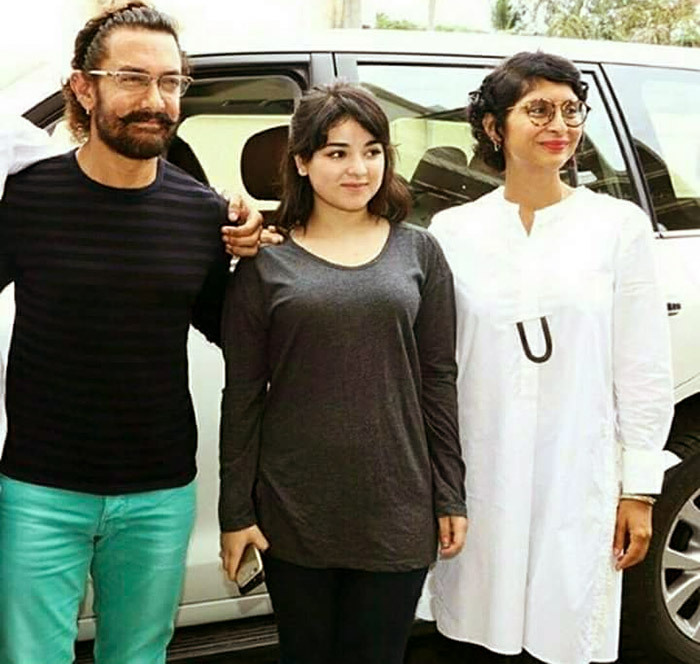 Zaira reveals that she, and the Dangal team, didn't expect such a phenomenal response to the film. "We knew Dangal would do well because it's a nice story but we didn't know that it would do so well," she says. "It's great that we got appreciated after all that hard work we put in." Does she feel the pressure to deliver again in Secret Superstar? "Yes, because I tend to over-think. I feel the pressure in everything I do. I feel the pressure even while I am sitting here right now. But I am very lucky and have been fortunate that I got the chance to work with Aamir twice," she says. 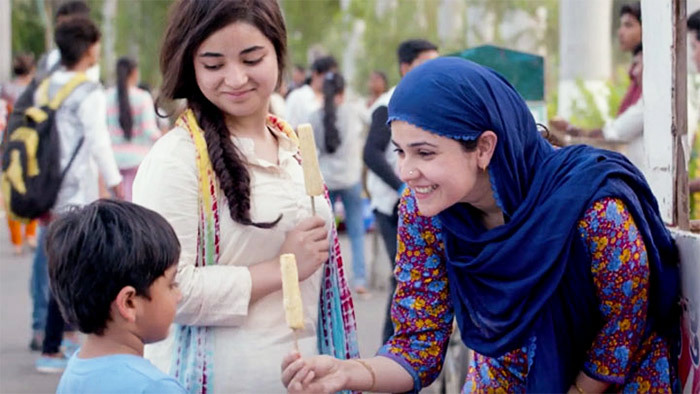 IMAGE: Kabir Shaikh, Zaira and Meher Vij share a cute moment in Secret Superstar. In Secret Superstar, Zaira's character aspires to be a singer even though her father is against it. In real life, Zaira doesn't relate to the character at all and found it challenging. "I come from a family which is very encouraging and supportive. We always sit and talk about what needs to be done in the future; if there's any decision to be made," she says. Her real father is very different from her reel one in Secret Superstar. "My father loves me too much. He is very possessive about me. "In the film, the father is rude, hostile and has patriarchal thoughts. You might have seen in the trailer how the father holds the girl's face. "My father has never hit me or yelled at me, so I did not know how to react. "Also, the thought that, somewhere in the world, this actually happens... it's scary and disturbing," Zaira says. It was the director, Advait Chandan, she says, who helped her to get into the skin of the character. Zaira cannot sing but she learnt to play the guitar for the film. "I reached a point when I became too OCD while performing. I was trying to make it sound like how it was actually played. In this film, I tried to be like an actor," she says. Ironically, Zaira doesn't like watching films. "In fact, I haven't seen a lot of Aamir Khan films. I hope I can develop a love for watching films," she says. She has watched Aamir's Taare Zameen Par and she loves it. But her favourite film, of course, is Dangal. IMAGE: Aamir Khan and Zaira in Secret Superstar. These days, Zaira is having sleepless nights. "Promotions are hectic," she explains. "Given the kind of person I am, it is very difficult for me to sit in front of people and interact with them. I am trying to overcome this. It will gradually go away I hope." She admits she's very nervous and excited before a film release. "I go numb!" she exclaims. She's been getting a lot of movie offers, so has studies taken a backseat for young Zaira, who is in Standard 11? "Kaash ho jaata," she sighs. "This year I was free, so I could manage (balancing studies and her movies) but, last year, when I was shooting for Secret Superstar, I was in Standard 10. It was a nightmare! "Initially, I was happy that I would get to miss school but then it hit me that it's the board exams and if I fail, I would be grounded for the rest of my life!" she says. In fact, her mother had warned her that if she doesn't get good marks, she would be "slaughtered". "People assume that since I've entered this field (I have quit studying). They ask me questions like, 'Beta, padhai chod di aapne, aap toh heroine ban gaye ho.' But I am still studying." 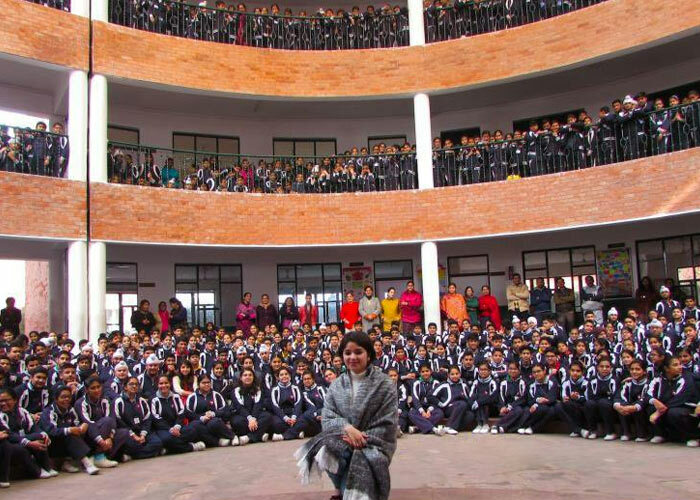 She adds, 'When I was in Standard 10, Kiran ma'am came to Kashmir to speak to my principal. When we stopped shooting, I studied for two months straight and then gave my board exams. I passed with 92 per cent." How many Aamir movies have you seen? What do Aamir, Akshay know that SRK, Salman don't?